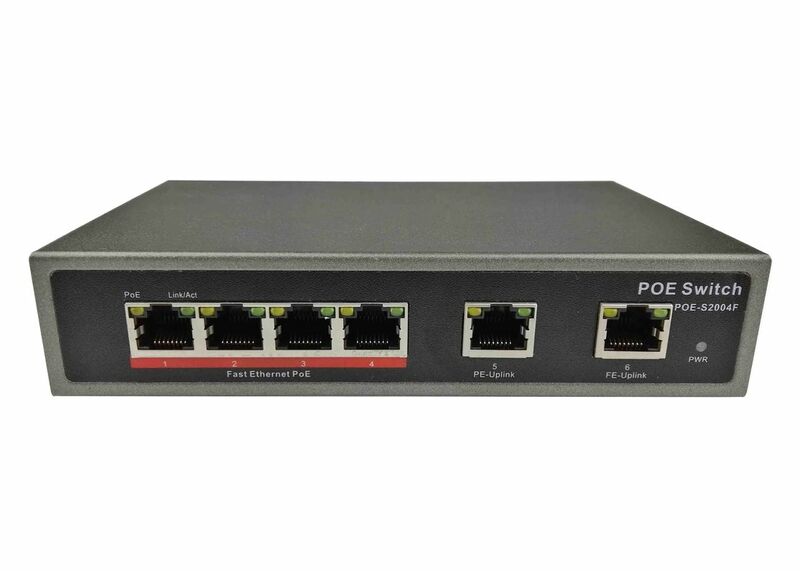 POE-S2004F is a 4 port Fast Ethernet Power over Ethernet switch with 2 port 10/100Mbps uplink, which enables it to has more cascading solutions at the same time. It’s IEEE802.3af/at compliant and equipped with 65W external power source and widely used in Network CCTV, Portable Device, Wireless Access Point, IP Phone and other compatible powered device. 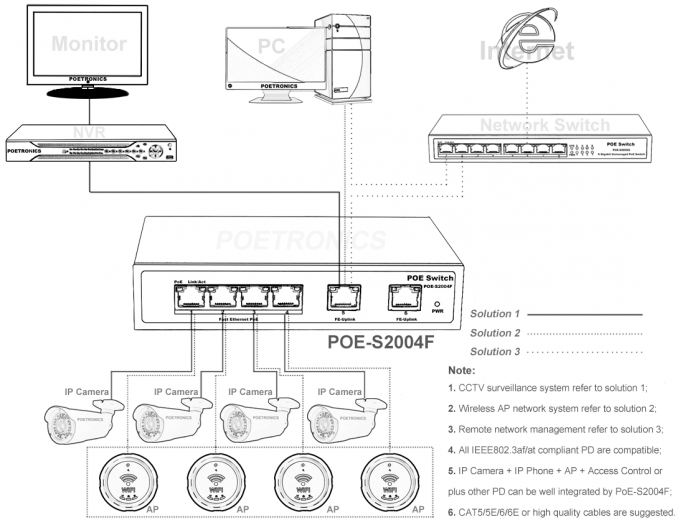 It is an extending version of POE-S1004F, as there is one more uplink port that is quite appropriate for specific condition and requirement, It's also popular in global distributing market of network system, meanwhile, it has strong practicality and specially suit for CCTV surveillance installed in household and home office and other network systems wherever campus, hospital, government, hotel, office building and elsewhere require Ethernet power source. Meanwhile, every single PoE port has max 30W output and pass through Ethernet cable that requiring cat-5 least or those in higher quality such as Cat5e, Cat6, Cat6e, Cat7, etc., which will make sure the least power lost in the the transmission towards to the terminal Powered Device. 4 ports 10/100Mbps POE + 2 ports 10/100Mbps uplink. Support wire speed switching and jumbo frame up to 9KB transmission.